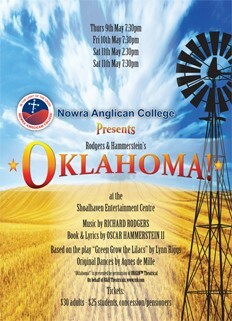 Following highly successful productions of The Sound of Music (2011), Annie (2009), the award winning (2007) production of My Fair Lady, and Fiddler on the Roof (2005), Nowra Anglican College is proud to announce that its forthcoming production - Oklahoma! - will go on stage at the Shoalhaven Entertainment Centre from the 9th to the 11th May 2013. Oklahoma! is the first of many musicals written by the composer Richard Rodgers and librettist Oscar Hammerstein II. The musical is based on Lynn Riggs’ 1931 play Green Grow the Lilacs and is set in Oklahoma Territory outside the town of Claremore in 1906. It tells the story of cowboy Curly McLain and his romance with farm girl Laurey Williams. A secondary romance concerns cowboy Will Parker and his flirtatious fiancée, Ado Annie. The original Broadway production opened on 31st March 1943. It was a box-office smash hit and ran for an unprecedented 2,243 performances, later enjoying award-winning revivals, national tours, foreign productions and an Academy Award-winning 1955 film adaptation. This stage production is Number Five in a string of successful Musicals performed by the students and friends of Nowra Anglican College. Over 70 cast and 40 musicians with backstage crew have come on board to meet this production’s numerous challenges. Musically, Oklahoma! has proven to be one of the classics in musical theatre with songs that include “Oh, What a Beautiful Morning”, “The Surrey with the Fringe on Top”, “People Will Say We’re in Love”, “I Cain‘t Say No”, “Oklahoma!” and many more, making this truly a musical treat for all the family.